(Photo: REUTERS / Andreea)U.S. Ambassador to the United Nations, Samantha Power (L) and Britain's U.N. 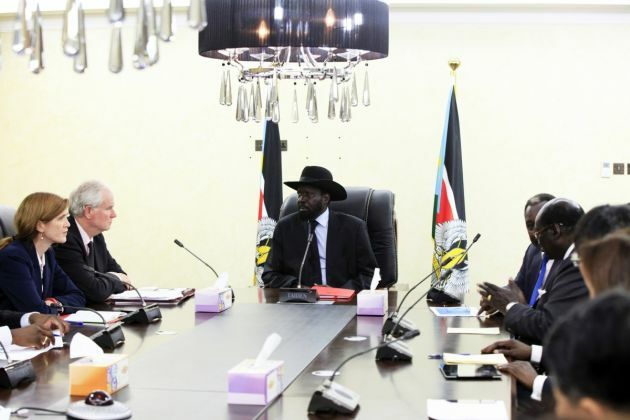 Ambassador Mark Lyall Grant (2nd L) meets with South Sudan's President Salva Kiir (C), during a visit by the United Nations Security Council, in the Office of the President in Juba August 12, 2014. GENEVA - The war in the world's newest nation continues, and the fighting has not halted despite a ceasefire agreement. "The guns have to go silent, so that people have the time to reflect, heal and move forward toward a path of peace," Fr. James Oyet Latansio, general secretary of the South Sudan Council of Churches says. Catholic priest Oyet Latansio was speaking about the recently signed "Compromise Agreement on the Resolution of the Conflict in the Republic of South Sudan" in Geneva. And at the opening of the U.N. Human Rights Council session Sept. 14, High Commissioner for Human Rights Zeid Ra'ad Al Hussein said, "There has also been near-absolute impunity for violations committed in South Sudan." He said U.N. mission in Sudan has reported "further shocking atrocities in the course of an upsurge in fighting that began in April." "I welcome the recent peace agreement and trust that there will be rigorous implementation of its provisions on transitional justice and accountability." Zeid cited a proposed hybrid court to try serious crimes, including genocide, war crimes and crimes against humanity. South Sudan churches leader Latansio spoke of the impact of violence on people in his country in an event hosted by the World Council of Churches on Sept. 9 at the Ecumenical Centre in Geneva, Switzerland. South Sudan, is a landlocked country in northeastern Africa that gained its independence from Sudan in 2011 after decades of civil war. The South Sudan Council of Churches encompasses the country's'Orthodox, Pentecostal, Protestant and Roman Catholic churches. The current South Sudan conflict started in 2013 provoking localized armed conflicts among various ethnic groups; between farmers and herdsmen for the control of pasture grounds and water resources. South Sudan's rebels and government say they will both send senior officials to a special meeting on the sidelines of the United Nations General Assembly on Sept. 29, Voice of America reports. The meeting follows an invitation by U.N. Secretary-General Ban Ki Moon. It is aimed at spurring the international community's support for the implementation of South Sudan's recently signed peace agreement. But South Sudan is awash with guns, Vatican Radio reported earlier in September. The bigger conflict between President Salva Kiir and his rival, Riek Machar has taken a serious toll on the nation triggering a serious a humanitarian crisis. Estimates say up to 4.6 million people are now facing serious food shortages, while millions have been displaced from their homes. They live in makeshift camps as refugees in neighbouring countries and as internally displaced persons in UN camps of South Sudan. Latansio reported that there remains a great amount of mistrust among parties that needs to be eliminated. "Churches in South Sudan consider the compromise peace agreement a road map for peace, and a step forward. "Yet to make peace a reality, on many levels, from political leaders to the common people, trust needs to be built." The proposed peace agreement was presented by the Intergovernmental Authority on Development in mid-July and urges an end to the on-going conflict in the country. In a recent statement issued by the (SSCC), the church leaders said, "We have consistently called for an immediate and unconditional end to the fighting. The war must stop immediately. "There is no moral justification for this senseless war. It is unacceptable that people continue to kill and be killed while leaders argue over power, positions and percentages." Latansio said that as a pastor he feels a great responsibility to proclaim "the word of God to the Christians, who have taken up arms against each other." "We must make sure that those who profit from wars are held accountable," he noted. The Church in South Sudan has provided a "neutral space" to people, where they can feel safe and share the pains they have suffered due to the conflict in the country, said Latansio. "This support is for everyone, including people who may be victims or perpetrators," he stated. Latansio explained that, by offering such forums, churches have helped initiate a dialogue, in which people can communicate, forgive, heal from the trauma and reconcile.